When his world was stolen, Mark Hogancamp made a world of his own. Mark Hogancamp: I was like an elephant left in charge of the peanuts. 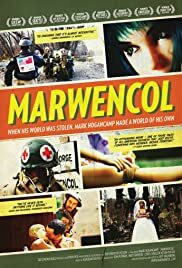 Q: What is the meaning of the title "Marwencol" ? I Want to Send Mark my Barbies! As I've mentioned, when the Cleveland International Film Festival catalog comes out. I read all the summaries and mark the movies I want to see. Marwencol jumped out at me for a few reasons. I had a boyfriend in college who lived near Kingston, NY, where this takes place. It's about a man who recovers from a head injury by building a world of miniatures in his backyard, it becomes therapy. My husband and son are into gaming and miniatures. I thought it sounded very interesting. Turns out the miniatures are more like dolls. And, the therapy was much more like fantasy and art. Mark Hogancamp was attacked in the parking lot of a bar by five guys he'd been drinking with. Head injuries forced him to learn to speak, write, walk and completely function, all over again. Before the accident, he was married, an alcoholic and a gifted artist. After the accident, he was a completely different person, because he had no memory of his previous life. Working with his figures, he's able to practice small motor function, develop his rich imagination and role play some of his anger and aggression. Because he couldn't draw anymore, he captured scenes on film, with his camera. Now, friends and admirers of his work are urging him to share his town, Marwencol, with the world, with a gallery showing, a book and this film. Mark Hogancamp is a sympathetic and interesting guy. 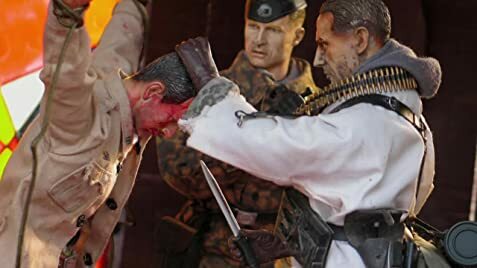 Marwencol is definitely an interesting place. Just when you think, "Okay, I get it, but this is weird," it gets weirder! But then, the pieces start to fit together. Fascinating story, well told, amazing imagery. It's an unforgettable place. Marwencol gets a 10 out of 10.